Ashworth attended Thinkers of our Time at the British Academy, London. The event discussed Sylvia’s creative approach to her campaigns and the contemporary resonances of her work. Ashworth’s film How Mermaids Breed was shortlisted for the Arts and Humanities Research Council (AHRC) Anniversary Research in Film Awards for her project How Mermaids Breed. The awards are “designed to recognise the creative and innovative work being undertaken at the interface between research and film by world-leading researchers, practitioners and filmmakers in the UK arts and humanities research community”. The winners will be announced on Thursday 12th November at a special Awards Ceremony at the BFI Southbank. To mark the shortlisting, Ashworth has put together clips from the making of How Mermaids Breed cut to a music track made for the film. Ashworth made a presentation of her work on Sylvia Pankhurst to the Faraday Ward Labour Party, Southwark to celebrate International Women’s Day and to explore how some of the suffragists campaigning methods could be adapted for today. Joan Ashworth is working with Editor/Filmmaker Jo Ann Kaplan for the next stage of the research making a film from the archive findings and experiments. Ashworth will be attending Clermont Ferrand Short Film Festival, France as part of We Are UK Film, in February 2014, supported by the British Council. 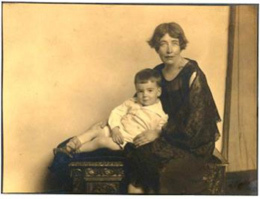 Sylvia Pankhurst and her son Richard. Double portrait circa 1932.